Enzymes are an easily disregarded subject when it comes to the health of your body’s systems. In fact, digestive enzymes are extremely important for the chemical breakdown of food, but they are also crucial for the function of your immune system. It’s important to know that your body only makes a limited number of these enzymes to spare and that it relies on you to consume raw food with natural enzymes built in for proper digestion. But people living today eat a lot of cooked and processed food that is lacking in enzymes. This can take energy, nutrients, and function away from the various processes of your body where it is needed most, which can cause sluggishness and poor immunity. You can replace these enzymes in your body with supplementation, however, and it has been touted as extremely beneficial by some medical professionals. But do digestive enzymes really work and what are the best digestive enzyme supplements? Digestive enzymes are secreted by your pancreas into your stomach and intestines for the chemical digestion of everything we consume. Proper digestion is extremely important for proper nutrition because it enables your body to absorb everything it needs from your food. There are several tweaks we can make to our lifestyle to promote smoother digestion of food. Chewing food properly to physically digest the food. This is the most important part of digestion and many people don’t chew enough. Chew properly to allow saliva to start breaking down carbohydrates. Saliva also helps your body recognize nutrients for proper absorption. Eat smaller portions to allow your body to make adequate use of a smaller amount of food. This allows your body to absorb what it needs while not feeling like it needs more. Eating too much too fast can lead to overeating and obesity. If our body doesn’t do this, our food can physically damage our insides. If we supplemented with a digestive enzyme supplement, we would be replacing all of the enzymes that are lost by cooking our foods and preventing unnecessary loss of nutrients during digestion. All we need to do is swallow or chew a small tablet when we eat a lot of cooked food or meat and we would be much healthier. Once you start taking a digestive enzyme supplement, your organs will experience much less stress due to the loss of nutrition from their cells. Healing of leaky gut from taking stress off of the intestinal tract. Assistance in breaking down difficult foods to digest like gluten, protein, casein and lactose. Enhanced nutrient absorption to treat nutritional deficiency. Destroy enzyme inhibitors found in foods like peanuts, wheat, eggs, beans and potatoes. These inhibitors can halt the function of our body’s enzymes and make digestion much more stressful. Improved tolerance to all foods. Improved allergies to food and pollen. I have tried a lot of digestive enzyme supplements to find one that I could find consistently good results with. The majority of the ones that I purchased from grocery store health sections did absolutely nothing. I think this has something to do with how stomach acid destroys the enzymes before they reach your intestines. You will have to find a supplement that incorporates a capsule that is acid resistant so that it can survive stomach acid. Most of the cheaper digestive enzyme supplements are just snake oil and have no benefit to your body. A very good one that I found is this enzyme blend. In my opinion, this is the best digestive enzyme supplement because it promises to survive stomach acid and potently digest food. This was the first enzyme supplement that I took and felt physical results within the hour. I take one before or after big meals that were cooked or when I accidently consume a food that I am intolerant to. My body has noticed smoother bowel movements, less bloating after meals and better concentration and energy after eating. I completely recommend it. It was such a great investment for my health. This enzyme blend is proven to work and I feel results within an hour of taking it. Click the image for a discount from our site! This product is completely natural and does not have any major side effects that a drug could give you. However, if you take too much of anything, your body could react adversely. If these symptoms are uncomfortable, simply lower your dose of digestive enzymes. Do Digestive Enzymes Really Work? The answer is YES, they do wonders for your body, especially if you are a meat eater or do not eat raw foods with each meal. Even if you do eat perfectly, taking one of these supplements would still give your body a nice boost. When choosing the best digestive enzyme supplement, you need to make sure that the blend of enzymes will cover a wide variety of food types to digest. 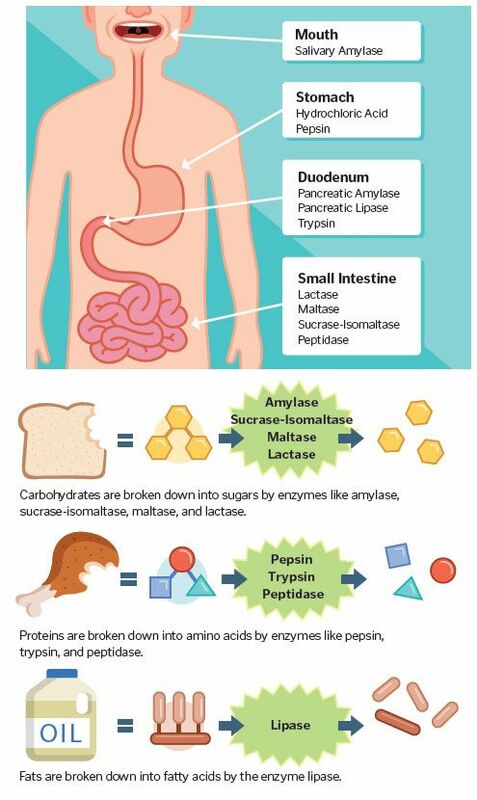 There are dozens of enzymes in your body that function in different ways. So if a supplement only have 3 types of enzymes, your body will not benefit to its full potential. The more types of enzymes the better. I am always here for you, so if you have a question or something to add about enzymes and what makes the best digestive enzyme supplement, please leave me a comment! Thanks Anthony, this is really useful information that not enough people know about. I see how indigestion can slow us down and even cause mental decline. Do think age increases indigestion? Have you heard of Isotonix digestive enzyme? Seems similar to this one. I think age definitely has something to do with the function of our bodies. Over time, our bodies lose its ability unfortunately, but we can assist it with external forces of course. This can be seen in some adults that lose their ability to produce the enzyme “lactase” and become lactose intolerant. Thanks for the insight!